I had no intention of writing you again this soon but after having dinner with your brother the other day and picking up a copy of a booklet you gave him entitled Studies In Contrasts: The Doctrine of Salvation (by Herb Vander Lugt and published by the Radio Bible Class, Grand Rapids, MI. ), I thought I’d drop you a short note. I was not surprised, but I was again disappointed in the obvious dishonesty (or ignorance) and the unfounded assumptions of the booklet. I decided to write a short note to ask you a few questions to see if you agree with me. First, I will be honest, I did not read the entire booklet. I first flipped to page 18. The title was Everyone / Not Everyone Will Be Judged. The first passage of Scripture quoted was John 5:28, 29, which was prominently placed in a text box at the top of the page. But first, before we look at John 5:28, 29, let’s take a look at the contrast that Herb Vander Lugt sets up. He says under the heading Explanation: “. . . we are told that all people, believers, and unbelievers [here is his contrast] will be resurrected and appear before Christ for final judgment.” He makes the opposing categories believers and unbelievers, but this is not what the Bible says. What contrast does the Bible set up? This booklet is written by those who are supposed to be the “Bible-people” who do not interpret the Bible on the basis of “tradition” but objectively, based on the supposed perspicuousness of the Scriptures. Let’s see how honest they are, or how blinded by their tradition they are . . . If the reader goes to the text box to read the passage of Scripture referred to, they will find this: “The hour is coming in which all who are in the graves will hear His voice and come forth . . . to the resurrection of life, and . . . to the resurrection of condemnation.” John 5:28, 29. Now, what do the three periods ellipses ( . . . ) delete from the text? An ellipsis is defined as by the American Heritage Dictionary as “The omission of a word not necessary for the comprehension of a sentence.” The unwary reader might expect believers and unbelievers to be the words cut out. Am I correct? This is of course what the author expects you to read and understand. He deceives his readers. Yet, get your Bible out and read for yourself the words of our Lord that the author “cut out” or deleted. “Marvel not at this: for the hour is coming, in the which all that are in the graves shall hear his voice, And shall come forth; they that have done good, unto the resurrection of life; and they that have done evil, unto the resurrection of damnation” (John 5:28, 29). My question to you is this: why did he remove words to hide the meaning of what our Lord Jesus was saying? And why do you condone such actions by believing and perpetrating the material? Why do you think Vander Lugt cut these essential words out? Was he trying to put words into our Lord Jesus’ mouth? Why did he want the readers to misunderstand what Jesus was actually saying? The author could not come up with a verse in the Bible that describes the final judgment in terms of faith vs. no faith, or belief vs. disbelief could he? There are no verses in the Bible that discuss the Judgement in these terms. In fact, isn’t it true that every time the judgement is discussed, the basis for judgement is deeds or actions or works? One must be careful of playing with our Lord’s words and especially careful of misrepresenting His intent. He condemns the Pharisees in no uncertain terms for doing exactly that. Exciting fun day! Camels and Dead Sea are enough to make it a fun day. Homily at Notre Dame here. See Jerusalem in miniature. Feet in Jordan River and floating in Dead Sea. 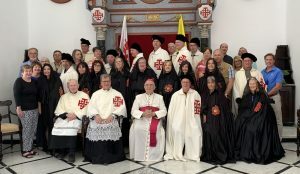 These Knights and Ladies of the Equestrian Order of the Holy Sepulchre are having a great time and the best Catholic experience possible in the Holy Land. Enjoy! We had a meeting in the Latin Patriarchate and this is our group after our audience with the bishop. All of the Knights and Ladies received their Pilgrimage Shells at the hands of the bishop.